I was looking for a pasta recipe and came across this one from Gordon Ramsay’s Ultimate Cookery Course. 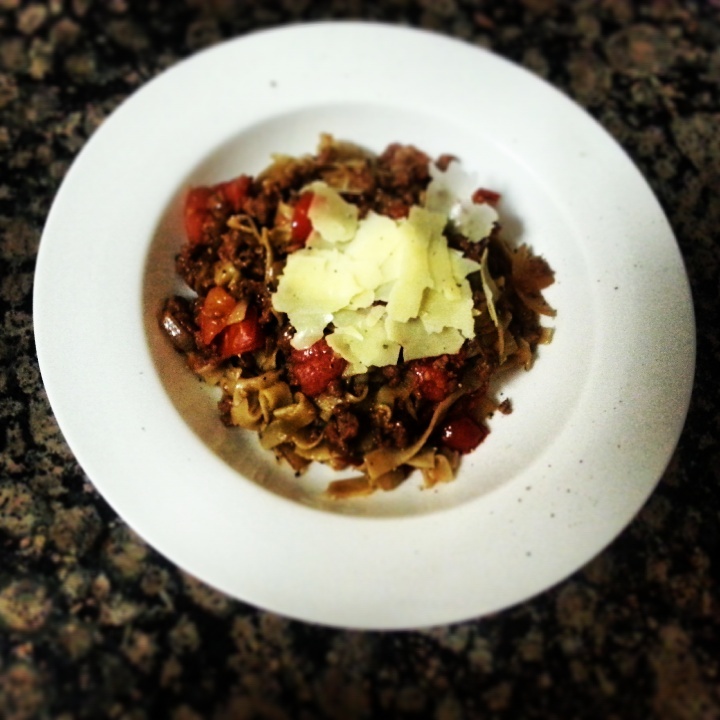 It’s a perfect weekday evening recipe because it’s so quick and easy. The success of this recipe is dependent on the choice of sausage. Buy good quality packed with flavour. Heat a large frying pan and add a little olive oil. 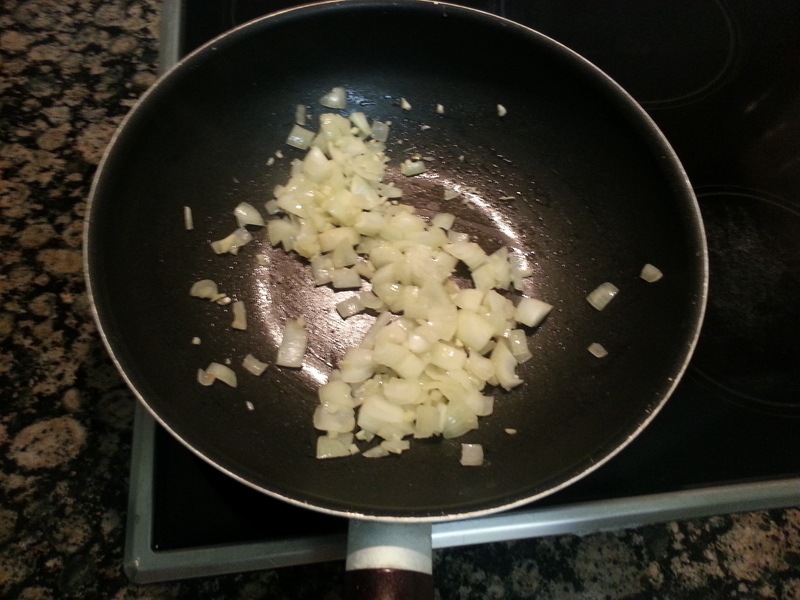 Sweat off the onions for 3 minutes and add the garlic for another 2 minutes or until the onion is softened. Remove the skins from the sausages and add to the frying pan. Break up the sausage meat as you fry it so that it resembles mince meat. Meanwhile start cooking the pasta as per the packet instructions. When the sausage meat is lightly coloured, add the halved tomatoes and a little seasoning to the pan and continue to cook over a medium heat for 5 minutes until the tomatoes begin to break down. 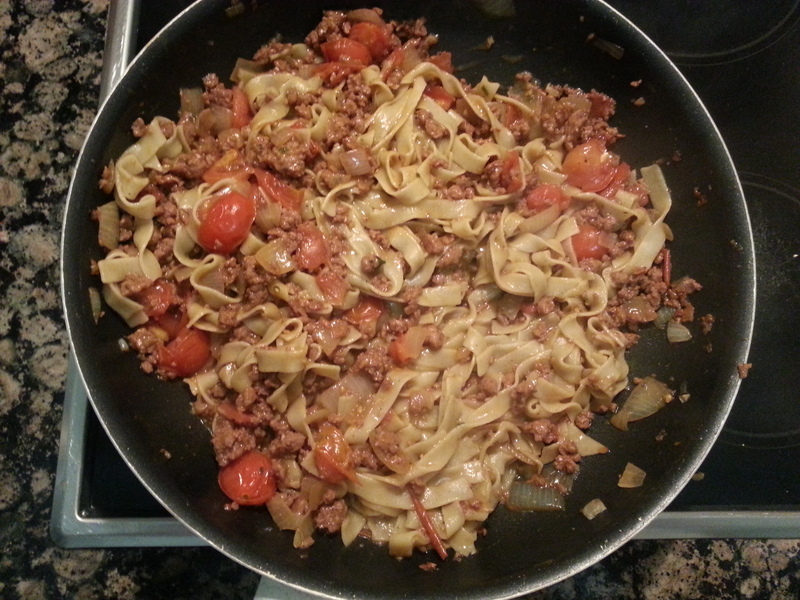 Add a tablespoon or two of pasta water to the pan as it cooks to create a sauce. Drain the pasta, reserving a further couple of tablespoons of the cooking water. Add the drained pasta directly to the pan with the sauce. Toss well, and loosen with a little more of the cooking water if necessary. Taste and adjust the seasoning. Serve hot with freshly grated Parmesan cheese. Here’s another salad idea from Weight Watchers. It’s really substantial, you don’t feel like you are going to be starving ten minutes later. I was actually starving making it so I didn’t get a chance to take any photos. Trust me it’s really good. I was a bit hesitant about the dressing but it tasted lovely, would consider using that for other salads. I ended up using Thai Style Turkey Sausages from Aldi for the recipe. They are great, even the in-house taste tester was impressed. 1. Place the potato in a saucepan and cover with cold water. Bring to the boil over high heat. Cook for 10 minutes or until tender. Drain and set aside to cool. 2. Meanwhile, heat the vegetable oil in a frying pan over medium-high heat. Cook the sausages, turning, for 6-8 minutes or until browned and cooked. Slice diagonally. 3. Using a food processor, process the rocket, yoghurt, olive oil, lemon juice and garlic until smooth. Season with salt and pepper. 4. Combine the potato, sausage, watercress, cucumber and tomato in a serving bowl. Drizzle with the rocket and yoghurt dressing and toss to coat. I got this recipe from the current Weight Watchers magazine. I used turkey sausages, I’ll be honest I thought they’d be repulsive but they are actually not too bad. It could possibly be to do with the fact that they are masked in the sauce. I got them because of the propoints value. Sausages are yum but they tend to be high in points. I like this recipe a lot and will definately try it again. Hope you give it a go. 5 minutes prep, 20 minutes cooking time. 1. Mist a nonstick pan with cooking spray and add the garlic, onion and chilli. Cook over a medium heat for 3-4 minutes until slightly softened, then add the sausages and increase the heat and cook for a further 5 minutes, breaking up the sausagemeat into small lumps. 2. 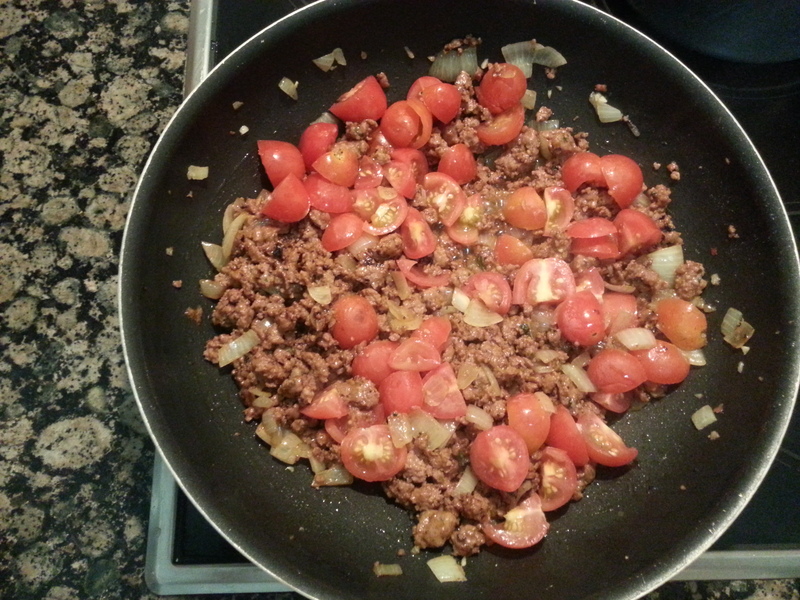 Add the bay leaf and tomatoes, season and cook for 5-10 minutes, until the tomatoes have softened. 3. Meanwhile, cook the pasta according to pack instructions. Drain, then mix into the tomato sauce. Stir in the creme fraiche, heat through for 1 minute, then serve garnished with the parsley, if using. Trim the ends of the Swiss chard and cut the green leaves off the white stems. Cut the stems into fine matchsticks and blanch in boiling salted water for 1-2 minutes, or until soft. Drain and set aside. Blanch the green leaves in boiling salted water for 4-5 minutes, then drain and chop roughly. Heat the olive oil in a large, heavy-based saucepan, add the onion and garlic and cook gently for 5-6 minutesm, or until soft. Add the pancetta and sausage meat and cook over a low heat for 20 minutes, then drain off the excess fat. Add the cream to the sauce and bring to the boil. Stir in the dried chilli and the blanched Swiss chard stalks and their leaves, then cook for 4-5 minutes. Season to taste, with salt and freshly ground black pepper. 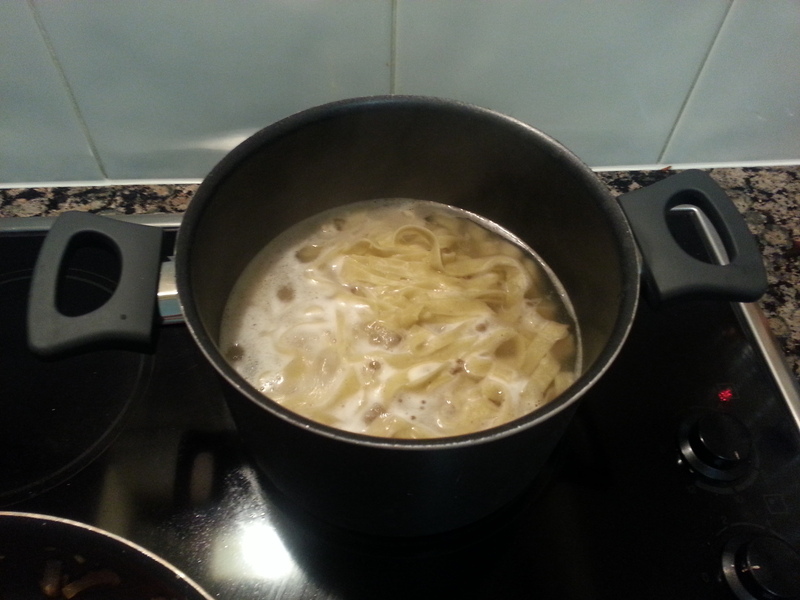 Cook the penne in a large pan of boiling water, according to packet instructions, until al dente. Drain, reserving a few spoonfuls of the cooking water. Add the pasta to the sauce, mix well and add a little of the reserved water if necessary to loosen the sauce. Cook gently for 2 minutes, then serve with freshly ground black pepper and grated parmesan. Note: I used spinach as I forgot to get the chard in the shop, it works well I think. This is fantastic and really simple to make. I will definately try this recipe again. It’s a Weight Watchers one, which is great. Guilt free pizza. Not quite sure I could stop at one slice though. 1. Prepare the pizza base mix according to the pack instructions. Mist a 25x35cm baking tray with cooking spray and dust with flour. 2. Roll out the dough thinly on a floured work surface to a 30x23cm rectangle. Transfer to the baking tray and set aside for 10 minutes. 3. Preheat the oven to gas mark 7/220 degrees celsius/200 degrees fahrenheit. 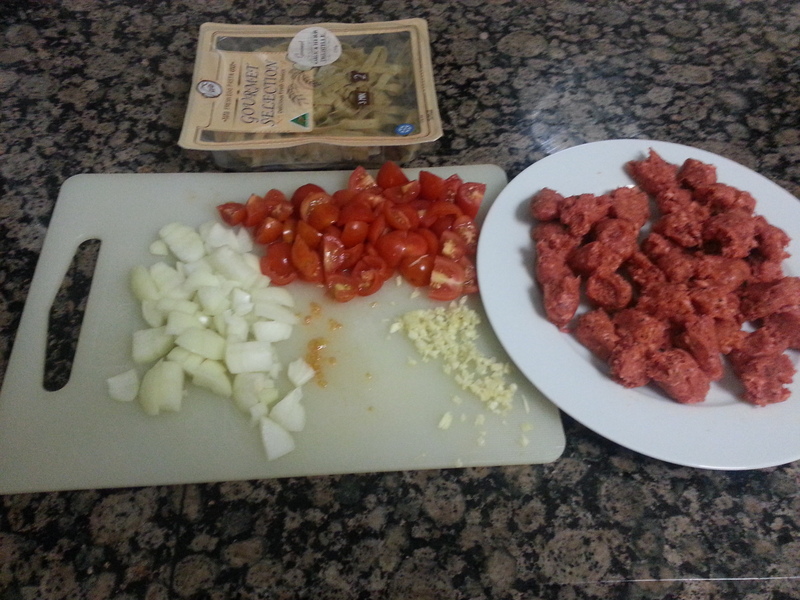 Mix together the passata, oregano, tomato puree and chilli flakes, if using. Spoon the sauce over the base in a thin layer, leaving a 1cm gap around the edge. 4. Squeeze the sausage meat out of its skins and make into 28 marble-sized balls. 5. Arrange them on top of the pizza, followed by the mozzarella and seasoning. Spray the top of the pizza with cooking spray. 6. Bake in the oven for about 12-15 minutes until the base is golden and crisp. Garnish with the basil leaves and cut into 4. Serve immediately. I tried this recipe this evening. It’s another one of Jamie Oliver’s 30 minutes meals. I thoroughly recommend this one. I’ll let you in on a little secret, I didn’t have any tinned tomatoes in stock so I had a jar of Gordon Ramsey’s pasta sauce in the press, so I used that. Either way this recipe is awesome. Slice 4 rashers of bacon about 1cm thick and add to a sturdy roasting tray with a few lugs of olive oil. Put over a high heat. Halve, peel and slice 1½ red onions. Lay the sausages in another roasting tray, drizzle and rub a little olive oil over them, then put under the grill to cook for 8 minutes. Stir your vegetables. BROCCOLI Put a small saucepan on a high heat. Trim and discard the ends of the broccoli. Tear the slices of bread into large chunks and put into a food processor with a pinch of salt & pepper, ½ of the reserved sprigs of sage, 2 cloves of garlic and a good drizzle of olive oil. Pulse until you have fairly even, coarse breadcrumbs. Peel and coarsely grate ¼ of a red onion into a mixing bowl. Crush over 1 clove of garlic. Halve the 2 plum tomatoes, discard the seeds, then carefully grate them, flesh side down, through the coarse grater. Discard the skins left behind. Add a couple of lugs of extra virgin olive oil, season carefully then squeeze in the juice of 1 lemon and mix. Take the sausages out of the oven. Put the roasting tray into the oven on the middle shelf for around 4 minutes, or until the breadcrumbs are crisp and golden. Put the broccoli, stalks down, into a pan of boiling water and put the lid on. Cook for a couple of minutes, or until tender. The broccoli should be tender by now, so drain it, then scatter on a platter and spoon over the dressing. Toss quickly, and take straight to the table. Remove the cassoulet from the oven and take to the table with a nice bottle of red wine. Notes: I couldn’t get chipolate sausages, so I got some cumberland sausages instead and cooked them in the pan for longer. I also couldn’t find haricot beans so I popped in some cannellini beans. I’m not a big fan of broccoli, so I used green beans instead.